Cancel that reservation at the Ivy: we don't care if you had to wait 6 months and perform unspeakable sexual favours to get it. Zagat's guide to eating in the capital has just been published – and it rates Wagamama the most popular restaurant in London. Of course, the Zagat rating system considers much more than just the food on offer – it takes into account price, value, atmosphere and so on. 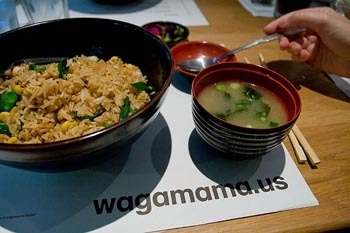 But the 5,300 volunteers who rate restaurants for the guide rated Wagamama the most popular restaurant of the year. The Ivy followed up in second place, with The Ritz winning the decor category. Photo courtesy of Phil Roman’s Photostream under the Creative Commons license.